We go all-out for Halloween. My, how the year flies! It's Halloween already. Michael has purchased enough candy to fill Fort Knox, got himself and Zachary outfitted with costumes and even bought me one, knowing that I don't usually have the time or energy to devote to the holiday, myself. 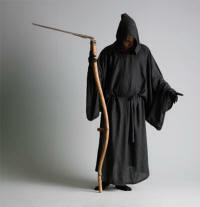 I was given a gown and hood as Death (AKA the Grim Reaper), complete with scythe. My job was to sit in a chair on the front porch and hand out candy to trick-or-treaters from an electronic box disguised as a book entitled "Spells and Potions" but which, when opened, said in a raspy witch's voice things like, "Have some CANDY! Don't you look SCARY!" 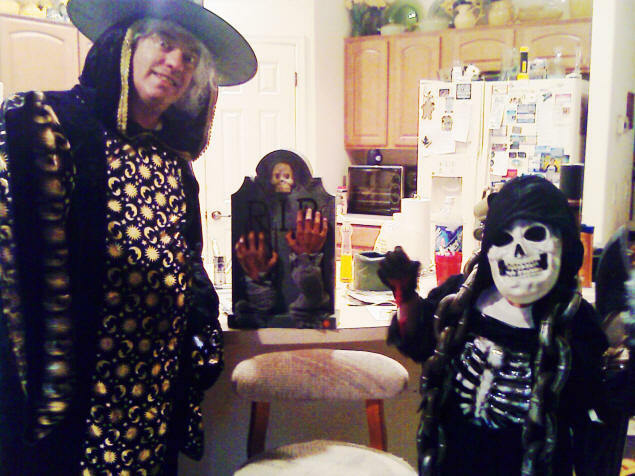 Apparently, what looked scary was me sitting on the porch dressed as Death. Several kids had to be dragged over to me by their parents, who either wanted their little ones to face their fears, or didn't want to miss out on Michael's bags of candy (or, as I prefer to call them, "Death By Abruptly Raised Blood Sugar Levels"). Nevertheless, we gave away every single bag, the last one going just before we turned off the porch light at 9pm. Before the actual trick-or-treating began, we went to our friends' church for a Halloween Party. When we got there it turned out to be an alternate to celebrating Halloween for adults. (That particular church doesn't have many kids in its roster.) So we cut our time there short. Now that he is nine, this was Zachary's first year in which he could roam the neighborhood with friends, but without grownups. When he returned, he didn't bring home a lot in the way of candy. When I asked him about it, he explained, "I don't really like candy that much. I just enjoyed going around in costume with my friends." Is it any wonder I love that kid?